Sometimes one stat is enough to sum up a game. Kerry had 8 attempts on goal scoring 7-00. Earlier in the year Dublin had 8 shots on goal against Kildare, including a penalty, and scored 5-01. The data doesn’t include 2015 games but from 2012 to 2014 one third of goal attempts are converted … you allow 8 goal shots a game, with the opposition converting 75% and you’re sunk. All 8 of Kerry’s goal attempts came in the second half but the foundation for those goals was laid in a dominant first half. Kerry had 5 more shots and 6 more possessions than Kildare but even more impressively they started out by converting 9 of their first 11 attempts. That 82% Conversion Rate is comparable to Dublin’s early blitz of Fermanagh. The first Cork – Kerry game was a tight, high quality affair. The replay was poorer fair as both teams wasted quite a lot of possession – accepting that the weather had an impact. The third was never a game as Kerry powered ahead whilst Kildare struggled to turn their possession in to scores. I haven’t updated the “charts” for 2015 but that Stephen O’Brien performance tops anything from 2012 -2014 in terms of accuracy. 1-04 from 5 shots with only one of the four point attempts coming from a central zone. It was a very intelligent performance from O’Brien (and selection from Kerry who dropped Buckley). Nominally Kevin Murnaghan was his marker but Murnaghan was playing a sweeping role. By keeping O’Brien in the attacking half he was able to find pockets of space as the Kildare players “lost” him when tracking back. In an attempt to push on in the second half Kildare appeared to go man on man; once identified Kerry brought on O’Sullivan and Kerry ran through Kildare. O’Donoghue and his replacement BJ Keane hit 6 from 6; the aforementioned O’Sullivan hit 3 from 4 (his only miss being the skied shot that he ran in after and ended up scoring his hat trick goal with – talk about hungry!) whilst Cooper converted 4 out of 5. Not a lot of waste there! Kerry dominated their own kickouts losing just the three. Four of their 19 wins came on short kickouts meaning that they won the battle on their own “contestable” kickouts 15-3. Not only was it a solid platform but it must have sucked the life out of Kildare seeing the engine room, that functioned so well against Cork, getting dominated in this manner. Kildare appear to have managed their own kickouts well but seven of their wins came on short kickouts in the 2nd half when the game was over. In the first half they won 9 of their 16 kickouts however the seven they lost were all grouped around a pivotal stage when Kerry were building their lead. The sequence for Kildare’s kickouts, after they won the first two, was Kerry, Kerry, Kerry, Kerry, Kerry, Kildare, Kerry, Kildare, Kerry. The quality of shooting on display at St. Conleth’s was top drawer. That Kildare return is up there with the best that I have compiled whilst the combined totals would be a match for any game. In his post match interview Jason Ryan commented that both teams would be reviewing their defensive displays. Mayo especially will not like conceding a shot rate of 85% though that is somewhat inflated by Tomas O’Connor’s interventions. All his scores came from shots that dropped short; Kildare never lost possession of the ball but had their shot counts doubled (their initial shots that dropped short plus O’Connor’s subsequent interventions). Kildare allowed 31 shots but will probably be more concerned by the number of goal chances they coughed up – five in total with a few more blasted points that could easily have worked the goalkeeper. Again Kildare were excellent. Bearing in mind that the average return for shots from play is 45% to hit close on 60% is an excellent day’s work. There is always the retort that “sure its only the league” and that when the play intensifies Kildare will not be able to maintain this standard. Given that the average is 45% no team could maintain this standard however the comment usually relates to the pressure that the player is under whilst shooting. The below table shows that Kildare’s total was padded by a majority of shots coming with no Mayo pressure applied however when there was pressure they actually shot better. Kildare were presented with the opportunities and executed – no more can be asked. Mayo’s defense will again be asking themselves how Kildare had 18 shots with no pressure applied though they will take heart from the lack of frees conceded. Whilst Mayo’s returns were dwarfed by Kildare’s they didn’t perform too badly – they were just about average. The fact that their Success Rate is above average but the weighting negative shows that they converted a lot of chances in close to goal but didn’t hit their expected share of more difficult ones. Of their ten scores from play only two were from outside the 20m line – both coming from Sector 5. Indeed Mayo only attempted one shot from play from the wings. Excellent displays all round. Hennelly’s three 45s in the first half all looked very comfortable – he had plenty of distance on all three – to such an extent that I was surprised Mayo didn’t put the ball down on the ground when fouled around the 45 and let him take a shot. A keeper’s not just for 45s – ask Cluxton! Kildare have struggled in the free taking stakes for a number of years now with John Doyle, Mikey Conway, Alan Smith, Seanie Johnston & Eoghan O’Flaherty all having tried over the past few years. Mulhall had a good day from the ground however two frees don’t a free taker make and it will be interesting to see how he progresses and whether Kildare can finally get something more than a serviceable free taker. Kildare’s full forward line scored a combined 1-9 from play but there were contrasting shooting performances therein. Brophy was excellent giving Colm Boyle all sorts of issues with his eight shots coming from six separate sectors (he scored from five). Mulhall on the other hand struggled but none of his shots came from in front of goal (Sectors 5 & 8). I’m sure the Kildare backroom team will be stressing shot selection decisions during the week. Finally Tomás O’Connor had what can only be described as a Tomas O’Connor outing. Scoring 1-2 from 4 shots is an excellent return however as mentioned before his three scores came from Kildare errors (shots dropping short). Whilst he may be one of the best in the game at picking up scraps his only other shooting contribution was a blocked shot. Gallagher is an exciting talent from Mayo and whilst his returns were not great he showed very well and was not afraid to pull the trigger. In many ways his willingness to shoot showed up the paucity of shooters else where in the forwards. In what was again an open game at Croke Park the difference between the teams was their ability to convert their chances. Kildare can take a lot of positives from this game. They started 6 U21s yet managed to have a shot rate of 85%. Normally such a high percentage is associated with very deliberate teams who patiently hold on to the ball waiting for the most advantageous opportunity before shooting. That wasn’t Kildare in this game. Instead they pulled the trigger whenever the opportunity arose. We’ll have more on their accuracy later! What is a positive for one team is almost by nature a negative for the opposition. Tyrone will be concerned at just how many shots Kildare got off. Kildare got 5 shots at goal and, of the 21 shots Kildare took from play for a point, only 57% were under any sort of pressure from a Tyrone player. Tyrone’s shooting from play was sublime (see table below) highlighted by Stephen O’Neill’s contribution. He had 4 shots, converted all 4, and also gave the hand pass that sprung Tyrone for the first goal. Their only concern, and a point of positive emphasis for Kildare, will be that they got so few shots from so much possession. You would have to think there will be a lot less space against Donegal thus they’ll have to up that shot rate from 69%. We have already highlighted Stephen O’Neill but the two Donnelly’s also had excellent shooting days; Mattie hit 3 out of 4 shots (Expected Return of +1.208) whilst Mark hit 2 from 2 (Expected Return of +1.178). The only blot on Tyrone’s day would be how quiet Séan Cavanagh was (2 shots, neither converted) however he did win three frees that turned into shots. Whilst it is almost unfair to highlight a player who has taken a team on his back countless times Doyle’s shooting, at times from poor angles whilst under pressure, let a lot of Kildare’s good approach work down. We saw with Cillian O’Connor that good players bounce back from a bad performance; Kildare will need Doyle to do so. We have already discussed Doyle’s poor day at the office. Negative returns are not a new phenomenon for Kildare; they only hit 40% (2 from 5; Expected Return of -0.733) against Kerry and 33% (4 from 12; Expected Return of -2.65) against Cork in last year’s All Ireland quarter-final. They have tried numerous players on free taking duty but just cannot find the consistency of the top teams. Tyrone were fine though they appear to be stretching Morgan to the limit of his very powerful leg. Some of the frees he took were monsters and he may be losing accuracy in an attempt to get distance. The last time we saw Kildare on the TV they were destroyed by a marauding Dublin team. They gave Dublin possession on their kickouts whilst being penned back on their own kickouts. Prior to that they had managed to hold their own against a strong Kerry team using Brian Flanagan under the majority of breaking balls. Since then Flanagan has gotten injured whilst they have changed goalkeeper. The net result – they managed to do well, in a possession sense, from their own kickouts (winning 60%) but were still very poor at defending their own kickouts that Tyrone won (Tyrone got 80% of shots from Kildare kickouts they won). Tyrone destroyed Kildare on their kickouts (winning 72%) however whether it was poor distribution from Tyrone, or good defensive work from Kildare, Tyrone were poor at converting that strength into shots. Unfortunately I am not an Irish speaker but even I could sense the TG4 commentator’s exasperation at both team’s shooting in Newbridge on Sunday. The table below confirms that it was well merited. 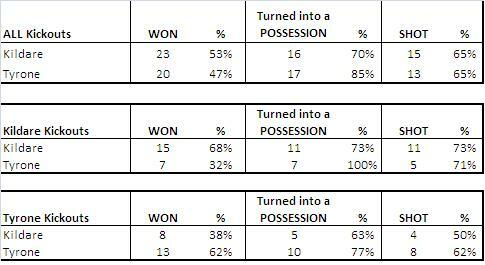 Kerry will be happy that they got their possession , and shots from possession, stats back up to average after two very poor weeks (see here). They can expect that with the likes of Cooper, Galvin, Declan O’Sullivan & a fully fit Darren O’Sullivan that their shooting will take care of itself once they hit the hard ground of June. Despite their win I would imagine Kildare will be less content. The last time we saw them here on the blog Cork’s man mountains destroyed them through the middle with their power running game. That didn’t happen so much here but Kildare still struggled for parity on the ball and it was particularly noticeable how they struggled late on once the “big man” (Buckley) started to dominate. Whilst acknowledging it is still only early March Kildare will need to do better on their shot selection. McGeeney has always encouraged his players to “take the shot” but those players for whom this does not come naturally will have to up their game in this department. 6 Kildare players took 1 shot each … only two, Brophy & Kelly, converted. 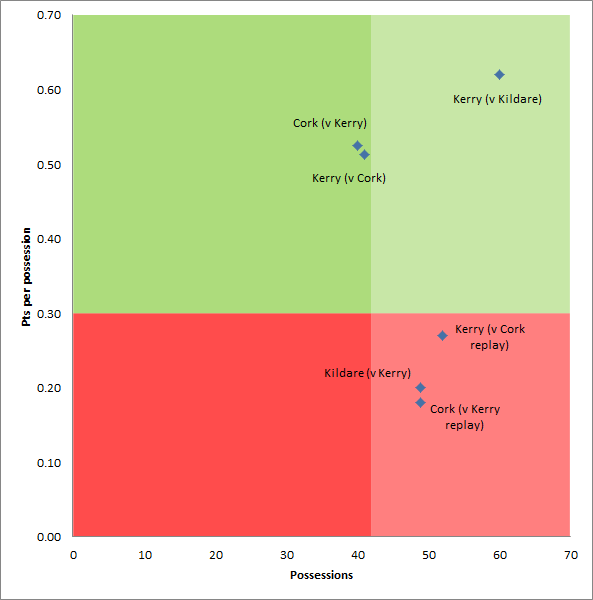 Both teams were not afraid to pull the trigger from play (a shift in gears for Kerry compared to the first two rounds of the league) however the accuracy was well below the expected 47%. O’Donoghue had a poor return from frees and this continues a worrying trend for Kerry. In the three games to date they have only hit 50% (8 from 16) with an Expected Return of -2.813. In last year’s Championship, even with Cooper & Sheehan hitting the majority of deadballs, they only hit 58% with a combined Expected Return of -3.0928. Compare that to the deadly accuracy from Donegal last year. Whilst this may only be the league, and there’s no reason for panic, a worrying trend is developing. On a side note John Doyle’s penalty was the first one I’ve charted as saved in well over 60 games …. Given Kerry’s relative dominance of kickouts (58% v Mayo off 36 kickouts; 56% v Dublin off 32) in the two previous games I was interested to see how Kildare, with a smaller mid 8, would approach this segment of the game. Overall I imagine Kildare will be fairly content. They are in the same vicinity, possession wise, as perceived better teams in Mayo & Dublin. Kerry won 71% possession on their own kickouts which is bang in line with the two previous games. Kildare were ahead in the possession stakes on their own kickouts until the final 15 minutes when Kerry won 4 in a row. Incidentally those 4 came at a time when Kildare went away from the strategy that had served them so well up to that point. Kildare had two pods; Morgan O’Flaherty standing under Daniel Flynn to pick up breaking ball and Brian Flanagan under Padraig O’Neill. The majority of kickouts went to the vicinity Flanagan was in (I made it 17 of the 24 Kildare kickouts that Flanagan was on the pitch for) and he was excellent at getting his hands on the dirty ball. Of the 4 we mentioned earlier none of them wen t to the O’Neill/Flanagan combo. At first glance the numbers show that despite the final score Kildare had their chances. Unfortunately for them their critics were proven correct – when the pressure came on their shooting let them down. What may come as a surprise is that it was their free taking that did for them and not their shooting from play (see below). Cork were (again) excellent. They turned possessions into shots and converted a high percentage of those shots. Both their shooting from play (63%; 15 from 24) and from deadballs (86%; 6 from 7) were top drawer. The one issue that Conor Counihan might worry about is that after they got their 2nd goal midway through the first half they only had 5 possessions and 2 shots for the rest of that half. In the same period they allowed Kildare 12 possessions and 9 shots. In what is expected to be a tight affair against Donegal they can’t allow such a fallow period. As stated Kildare had their chances. When they got within 3 points they then missed two frees, a snatched Alan Smith shot from in front of goal and a Daryl Flynn shot from relatively straight in front of the posts. In the 4 possessions after this Cork scored 3 points and broke Kildare. Now perhaps Cork’s returns from play were aided by an easy second half, when Kildare were beaten and the middle opened up, however we must remember that they were quite good against Kerry as well in a competitive game. One cannot question Cork’s deadball striking however – when Kildare were generally on top in the first 10-15 minutes Cork hit 4 wonderful deadballs to keep in touch (O’Neill wide right, O’Connor wide left, Walsh from outside the 45m line & an O’Connor 45m). Given Kildare’s struggles with deadballs the difference was remarkeable and must have eaten away at Kildare’s belief. A note on Kildare’s deadball striking. In 2010 when Kildare got to the semi final their shooting from play was excellent however the deadball striking let them down. John Doyle was, in the main, on the frees then and I assume that Kildare looked at the stats & then tried to develop alternatives. Unfortunately those alternatives didn’t fire in this game. Kildare carried 3 non scoring forwards in O’Connor, E O’Flaherty & Conway. Between them they took 1 shot from play. O’Connor did do his ‘job’ in that he won 3 frees that resulted in shots however O’Flaherty & Conway just didn’t click at all. Kildare may need to re think carrying all 3.